Hi readers. 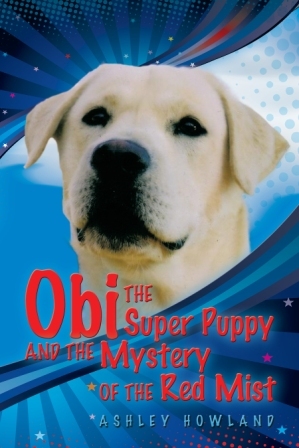 Today I am joined by Ashley Howland, author of “Obi The Super Puppy“, and “Ghostnapped“. Ashley lives in Adelaide, South Australia. 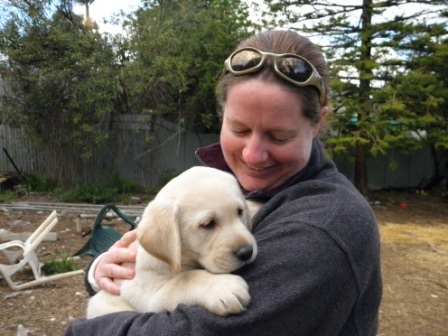 She and her dogs, Obi and Stitch, work for Labs ‘n Life, a nonprofit organization that works with youth at risk to train Labradors as autism assistance dogs (www.labsnlife.com). She is inspired to write by her husband Ross, her daughters, Maddy and Aijay, and of course, Obi and Stitch. They are a constant, endless source of material and happiness. Her next book is a novel for teenagers titled It’s What You Do Next That Counts. Ashley, thanks for being here today. Please tell us about you. I am a mother, teacher and writer. I love to create characters and stories with my two girls. with them bouncing around. The dogs are just as energetic. I’d have to say Andy Griffiths and yes my girls would have to come. They love his books and would love a chance to spend the day writing with him. It’s What You Do Next That Counts is a book for teenagers. It’s about a year in the life of a sixteen year old girl. Her parents have died and she has moved countries to live with her Aunt and Uncle. It’s a book with a lot happening. Callie the main character has made some pretty tough decisions, but she meets some great new people on the way. To me this book is all about friendship and finding yourself. It is set in Perth and Vancouver, two cities that are worlds apart. This book will appeal to boys and girls, there is a lot of Australian life in the story, with the beach, cricket and other sports playing and important part. I will be releasing this book on Kindle towards the middle of March and then the print version will follow! This one is called Obi the Super Puppy and the Quest for the Last Laugh. These books are about my first Labrador, who thought he was a super hero. He was always doing strange things, but with such purpose. In these books he tells my two girls all about his adventures. The second book also introduces our next Lab – Stitch. It’s been a lot of fun to write about Obi and keep his memory alive. Most people will tell me that writing is a special or extraordinary talent, I hope it is. However I think my desire to do things and to be creative is more amazing. I’m not sure I am very talented at most of the things I do, but I still like to do them. One example is cake decorating. Every birthday I create cakes for the girls. They love to make it hard for me too. One ear it was Snow White and the seven smurfs on a pirate ship. I was up for the challenge and it ended up being pretty cool. I am still mastering cake pops, but it will not defeat me. I can now do something that resembles a reindeer, monkey and polar bear.It’s a bit of a laugh as the girls love to see what I can come up with. John Flanagan (love the Ranger’s Apprentice). I read a lot and like to try different authors. Basically I love books with action, mystery and a good laugh. I think it’s important to find some time just for you and to do something you love. I also have twitter, Pinterest, Goodreads and Amazon. I can also be emailed at ashley@ahowland.org as part of my blog I run Stitch Says which is a chance for me to help promote other children’s authors. I offer reviews and interviews. I’d just like to say thank you for this opportunity. I am very passionate about reading and writing so it’s great to be able share on a forum like this! Posted on March 18, 2015, in Guest Authors, Interviews and tagged Ashley Howland, author interview, Ghostnapped, It’s What You Do Next That Counts, Labs ‘n Life, Obi The Super Puppy, Obi the Super Puppy and the Mystery of the Red Mist, Obi the Super Puppy and the Quest for the Last Laugh, Princess Sea Adventures, The Lighting Lilly, Writer. Bookmark the permalink. 3 Comments. Thanks to Chris for the interview! Thanks for the interview Chris!